I was really excited when I heard that Frankenweenie was being remade. A dark-humored, animated Tim Burton flick that gives nods to classic horror movies, you say? How could I lose!? I’ve seen and enjoyed the original (don’t tell my fifth grade teacher that my “really creative short story” was actually a plagiarised movie she hadn’t seen…), and being a fan of Burton and classic movies in general, I was psyched. 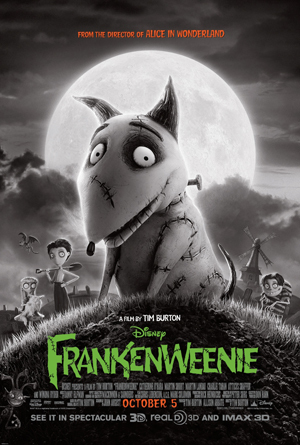 Frankenweenie completely follows the Tim Burton atmosphere template. A copied and pasted landscape of perfect little houses with manicured hedges? Check. An obnoxious, power-trippy mayor? Check. Gothic teenagers with oblivious parents that don’t get concerned when the crazy gets let out? Check. Ah, suburbia. If you’ve seen Burton’s sketches, the characters look exactly like three-dimensional models of his work, complete with the scratchy shading that makes everything look like it was created with a ball-point pen, and it’s nice to see actual stop-motion techniques being used over the sometimes-too-smooth flow of computer-animated flicks. Burton’s style is a perfect match to the subject matter, and I would be completely comfortable spending an afternoon poring over sketches used for the film. While some of the gags are fun and it was well-suited for kids, my main complaint about the movie is that it never goes far enough in one direction to fully do it for me. It’s not cutesy or funny enough to be a great kid’s movie, not creepy enough to be a staple of the style (think Nightmare Before Christmas), and considering the entire nature of the film, it seemed to be severely lacking in black comedy. They had time for a five-minute poop joke, yet the tongue-in-cheek humor never quite seems to come to life. There’s also a complete lack of conflict or tension. There are scenes involving kids breaking into and quietly snooping around houses while stealing things, digging up corpses in a graveyard and then sneaking the corpses around, all while trying to keep parents, and the mayor, who seems to hate children and everything that they do, from discovering what’s going on. But despite all of this, at no point does the audience feel like anyone’s in any real danger of getting caught or that their actions have any lasting consequences, and it’s hard to be invested in a story with no real conflict. All in all, I felt very “meh” about the whole feature, despite being a geeked-out fanboy. I’d still recommend it to any fans of Tim Burton or the horror genre in general, but considering it’s a remake of a 28 year old movie that got Burton fired from Disney, I expected much more from it. All in all it felt like an unsatisfying meal that, though I’m glad to know what it tasted like, left me hungry. But, while the movie itself was nothing to get excited about, I did have a pretty great time testing myself to see how many references to classic horror movies I could catch. A Frankenweenie drinking game needs to happen. Maybe Bingo. – The science teacher Mr. Rzykruski is modeled after Vincent Price, and is one of the most fun characters in the movie. – Victor’s classmate Edgar E. Gore is Igor. – Nassor, a rival of the protagonist Victor, resembles Boris Karloff’s Frankenstein’s monster. Towards the end of the movie, Nassor gets wrapped in paper and entombed like the Mummy, another monster that Karloff played. Side note here: It felt kind of weird to have a kid with no relation to Victor Frankenstein’s family, resembling Frankenstein’s monster. I feel like maybe he should have been a half-brother or something, which would have been easy enough to do since the parents in the movie have such a minimal role. 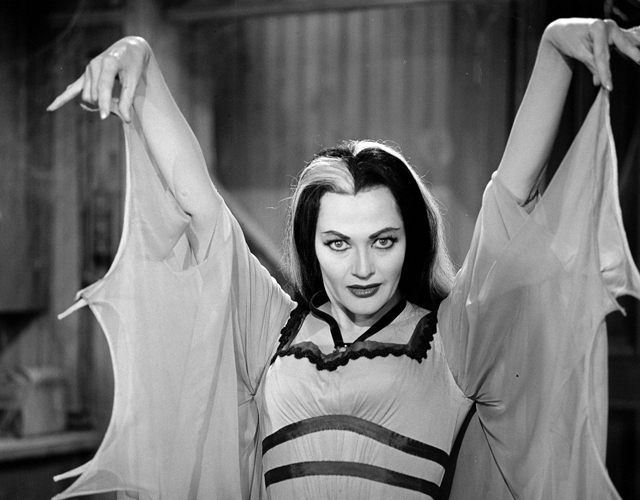 – Victor’s neighbor (played by Winona Ryder) is named Elsa Van Helsing, a nod to Dracula’s vampire hunter, and looks and acts just like her character from Beetlejuice. – Mutated sea monkeys (seriously) actually resemble several creatures. They have appearances similar to the Creature from the Black Lagoon, emerge from a pool and behave like Gremlins, and even pop out of a toilet like the Ghoulies. You do remember the Ghoulies, right? Shelley was the author of the original Frankenstein. So there’s that, too. Side note #2: I couldn’t help but feel few collar-tug moments with some of this kid’s scenes. He’s Japanese, and is the only non-white character, has an accent, plays baseball, is incredibly smart, and creates a giant reptile. I kept waiting for him to break out a cello and do some calculus before yelling “Gojira!” and doing the Asian version of blackface. – In the pet cemetery, an angry black cat appears, a la Stephen King’s Pet Sematary. This might be a stretch, but I stand by it. – The neighbor’s dog, Persephone Van Helsing (seriously), sports a Bride of Frankenstein hairstyle as the result of an electric shock. In my opinion, they pulled out this gag way too early in the movie, and it completely loses its effect over the course of the story. And that’s just what I caught and can remember from one viewing. Honestly, I’d probably watch it again just to see what I missed. All in all, Frankenweenie is by no means a bad movie, but you need to check your expectations at the door, and enjoy it for what it is.